M. Lorraine Wagnild passed away peacefully on Monday, October 22, 2018 at Buffalo Hill Terrace. She was born June 15, 1927 an only child to Robert & Genevieve Baird in Grafton, ND. 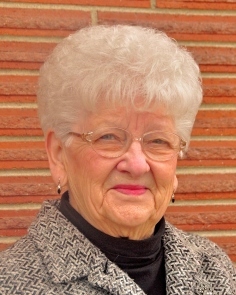 She grew up on a small farm outside of Grafton and graduated from high school in 1945. She then graduated from Dakota Business College in Fargo, ND where she met and fell in love with her life partner C. Edwin Wagnild. They were then married on a below 0 day January 17, 1948 in Fargo, ND. After working in Fargo they went on vacation to the Flathead Valley and fell in love with this beautiful place. They moved to Kalispell where Ed was self-employed his whole career. She then had a son and daughter. When Sandy entered school, Lorraine started her career as the office manager/bookkeeper at Immanuel Lutheran Home in 1961. She worked with three administrators and when the board was looking for the fourth, they did not have far to look. She enjoyed her time as administrator and surrounded herself with a dedicated and knowledgeable staff. During this time the board started the planning and building of Buffalo Hill Terrace. She retired in June 1989 with a celebration in the new Buffalo Hill Terrace. Lorraine and Ed loved to travel and saw all 50 states and 6 continents. She loved to volunteer at Christian Science Reading Room, Buffalo Hill Terrace Store and Peterson School Library over the years. She was a member of 1st Church of Christ, Scientist in Kalispell. She also belonged to Chapter AB, PEO – Sons of Norway – Soroptimist. She might not have been born a Norwegian but she became one in heart with her talent of making and teaching others on the art of Lefsa making. She also made the best pies. You have taught us well Mom, we will soldier on. She is survived by son, Bob (Shelley) and daughter Sandy (Joe) Magnan of Kalispell. Grandchildren; Ryan (Ashley) Wagnild of Billings, MT Megan (Josh) Shepard of Kalispell – Andrea (Joel) Christensen, Heather (Josh) Peters of Clinton, MT. and great-grandchildren, Jordan Wagnild, Samantha, Kassidy, Haeli Shepard and Barrett Peters. Lorraine is also survived by a sister-in-law, several nieces and nephews. The family would like to thank the staff of Buffalo Hill Terrace for their care and kindness to Lorraine. Inurnment will be at C.E. Conrad Memorial Cemetery. Johnson-Gloschat Funeral Home is caring for the family.